INS Vikramaditya is the Indian Navy's biggest warship. Image courtesy of Indian Navy. INS Vikramaditya was commissioned in November 2013. Image courtesy of Indian Navy. The warship has an overall length of 284m. Image courtesy of Indian Navy. INS Vikramaditya is equipped with expansive flight deck. Image courtesy of Indian Navy. The INS Vikramaditya aircraft carrier completed sea trials in July 2013. Image courtesy of Indian Navy. INS Vikramaditya can sail at speeds over 30kt. Image courtesy of Indian Navy. INS Vikramaditya is the Indian Navy’s largest short take-off, but assisted recovery (STOBAR) aircraft carrier and warship converted from the Russian Navy’s decommissioned Admiral Gorshkov vertical take-off and landing (VTOL) missile cruiser carrier. INS Vikramaditya was commissioned into service in November 2013. The warship has been extensively refurbished with new propulsion systems, hull sections, sensors and flight deck. It was operationally deployed with full complement of MiG-29 aircraft in May 2014. The vessel can carry more than 30 long-range multi-role fighters with anti-ship missiles, air-to-air missiles, guided bombs and rockets. The aircraft aboard the carrier include MiG 29K / Sea Harrier combat aircraft, Kamov 31 radar picket Airborne Early Warning (AEW) helicopter, Kamov 28 naval helicopter, Sea King helicopter, ALH-Dhruv, and Chetak helicopter. The Admiral Gorshkov (Project 11430) is a modified Kiev-class aircraft carrier built at the Nikolayev South shipyard, for the Russian Navy. Initially known as Baku, the carrier was launched in 1982 and commissioned in 1987. The Admiral Gorshkov was inactivated in 1995. The Vikrant Class are the first indigenously designed and built aircraft carriers in India. India entered into negotiations with Russia for the acquisition of Admiral Gorshkov aircraft carrier in 1994 and signed a memorandum of understanding in December 1998. The Union Government of India and the Federation of Russia signed an inter-governmental agreement for the acquisition in October 2000. In January 2004, India signed a $1.5bn deal with Russia for the modernisation of Admiral Gorshkov and delivery of 12 single-seat MiG-29K and four two-seat MiG-29KUB aircraft. The refurbishment works were commenced at the FSUE Sevmash shipyard in Severodvinsk, Russia, in April 2004. The cost for repair and refit of the carrier, spares, infrastructure augmentation and documentation was estimated to be $974m. The modernised warship was initially scheduled to be delivered by August 2008 but was delayed due to cost overruns. The two countries reached an agreement on the final delivery and entire cost of the upgraded warship in December 2009. The deal was finalised in March 2010, the cost was fixed at $2.33bn and delivery was scheduled for December 2012. The overhaul was completed by March 2012 and the first sea trials began in June 2012. The delivery was however delayed again due to defects encountered in boilers and the need for replacement of additional electrical cables. The modernised carrier completed final sea trials in the White Sea in July 2013 and aviation trials in November 2013. The INS Vikramaditya will be integrated with close in weapon system (CIWS) and Barak 8 long-range air-defence system (LR-SAM) between 2015 and 2017. The refurbished aircraft carrier INS Vikramaditya is equipped with 234 new hull sections constructed using 2,500t of steel. It has an overall length of 284m, a maximum beam of 60m, height of about 60m and a displacement of 44,500t. The warship features 22 decks and 2,500 compartments, of which 1,750 were completely re-built. It can carry more than 1,600 personnel including crew. Sponsons are installed to increase the breadth at the flight deck. The modernised ship is also equipped with flight deck lighting systems, new AC plants, refrigeration plants, 14° sky jump, 30m wide arrester gears, three restraining gears, and two reverse osmosis plants for producing 400t of fresh water per day. The modifications also included replacement of 2,300km of old electrical cables with new cables, upgrades to bulbous bow, and replacement of distilling plants. The aft aircraft lift and ammunition lifts were also upgraded. 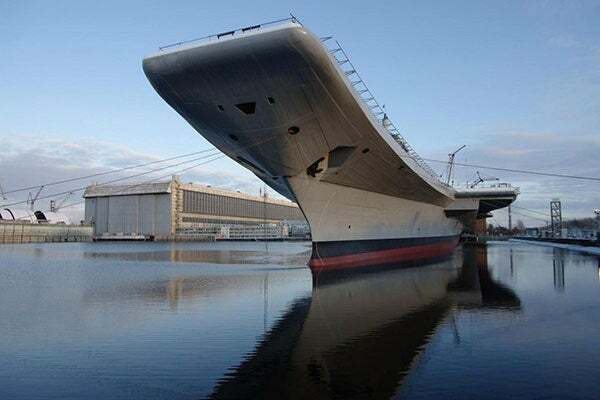 The re-equipped superstructure of the Vikramaditya houses state-of-the-art launch and recovery systems, long-range air surveillance radars and advanced electronic warfare suite. "The latest CCS MK II communication complex onboard the Vikramaditya provides external communication." The aircraft carrier is equipped with LUNA and DAPS landing systems for MiG and Sea Harriers jet fighters respectively. A computer aided action information organisation (CAIO) system named LESORUB-E is fitted to provide combat control and direction. The system collects information from sensors and data links and performs computer-aided processing. The ship is also fitted with an automated Resistor-E radar complex and various subsystems to provide air traffic control and approach / landing for carrier-based aircraft. The radar system provides short-range navigation and flight data for the aircraft. The precision approach guidance system of the Resistor-E complex provides flying craft guidance during a precision approach. The latest CCS MK II communication complex onboard the Vikramaditya provides external communication. A Link II tactical data system is also installed to support network centric operations. The INS Vikramaditya is powered by eight new generation boilers, which produce a total power of 180,000shp driving four huge propellers. Each boiler generates 100tph of steam at a very high pressure of 64bar. The ship also employs six turbo alternators and six diesel alternators, which produce a total power of 18MW. The warship can carry more than 8,000t of low sulphur high speed diesel. It has a maximum speed of over 30kt and can attain a maximum range of 7,000nmi. It can endure at sea up to 45 days.